21-Aug-2001 -- This was my sixth stop on a 7-day, 3200km confluence hunting trip to the BC interior, covering 51N121W, 52N121W, 52N122W, 52N123W, 52N125W, 52N124W, 54N124W, 54N125W, and 53N123W. Having spent the night at the Eagle Lake campsite, I got up early, packed up, departed the campsite at 7AM, and drove back to Highway 20, then headed East. Before reaching Chilanko Forks, I took a picture(#2) from a viewpoint, with the confluence in the middle of the picture, 13.8km away. I took this in anticipation of this visit being listed as an attempt, because I didn't have a clear indication from the map that I could drive anywhere close to this confluence, and also I was expecting that it might turn rainy, in which case I was prepared to forgo reaching this confluence, and instead head north towards Prince George to continue my trip. I turned of the highway onto Chipman Road, then went left at a fork, on 5000 Forest Development Road, which was not on my map. At the next fork I went to the left, and then turned left where another road joined a straight section of the road I was on. Going down this road, I first tried going left at a fork, but quickly decided that road was going to lead away from the confluence. I went back and took the right side of the fork, and quickly found that this road had been deactivated, which means that the forestry company removes any culverts that were installed, so what is left is typically a trench in the road, with a mound of dirt on each side. Sometimes these can get quite large and deep, if the amaount of water that drains through that area is large. Some people, perhaps hunters, must use this road, because a number of these 'water bars' had logs and rocks in them to make driving through easier. After driving for a while, including through numerous water bars of varying sizes, I was confronted with a tree that had blown down across the road. I decided that this wasn't going to stop me, so I blocked the Pathfinder's tires with rocks, hooked the winch cable to the tree, draped the sleeping bag over the winch cable for safety, and started pulling. I had to reposition the car a couple of times to complete the job, but I got the tree pulled over far enough to be able to drive by. Of course, having disconnected the power cable to the winch, and put away the winch remote control cable, a few minutes further down the road I came to another tree across the road. This one was smaller, and I was able to just use the winch cable and my car to drag it out of the way. Just past this second tree the road ended at a clearcut, and seeing as I had gone to all the work to get that far, and the confluence was now 2.8km to the east, I decided that I had to get there. I set a waypoint at the car, and with bear spray handy, and wearing a bear bell, I set out from the car towards the confluence at 10:20AM. Initially the hike was across the clearcut, but then entered a treed area. This pattern of clearing then trees repeated itself numerous times. At times the pace was slow, because lots of the areas with trees had a lot of small trees, spaced closely together, so that you could not walk in a straight line, and constantly had to zig-zag back and forth between trees that were spaced far enough apart to allow 'easy' passage. Even with the zig-zags, I was often having to hold trees and branches aside. Needless to say, each clearing, whether a cut block or a natural clearing, was welcome relief. 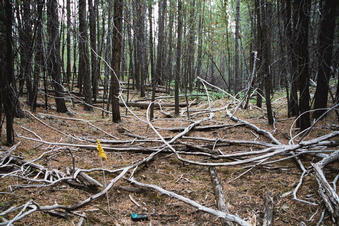 After hiking for an hour, I came across a natural clearing that had some surveyor's tape in places along its perimeter. This tape had the following handwritten on it: "POT OF 'T' ROAD C.F.L. D.M. C.T. 14/03/00". Ten minutes later, at another natural clearing, was some more tape, this time pre-printed with "RIVERSIDE BLOCK BOUNDARY". This area is probably going to be cut, which means that there are, or will be, roads in the area, which in the future may mean this confluence would be easier to achieve. I reached the confluence at 11:50AM. The combination of the satellite configuration and the tree cover meant that getting a stable reading was difficult, so I didn't get "all zeros" this time. The picture to the East gives a good idea of why I hadn't been hiking in a straight line. I left the confluence at 12:05PM. On the way back I tried to take the most efficient route, and although it wasn't much different than my path in, I did come across a different clearcut after an hour, which may be served by a different road system than the one I used, so maybe there is more than one way to drive closer to the confluence. At 1:15, in another clearcut, I took picture #6 - I'm sure the mountains would look better on a sunny day. Just as I reached this spot, a light rain had started. 15 minutes later, I was back at the car. As I said earlier, I hadn't expected to be able to list this confluence as a success, so it was nice to be able to say that I now had four successful visits in a row on this trip. I had no more visits planned along the 52nd latitude, so I was going to head back to Williams Lake, then north. Because the expected rain had arrived, and the forecast was for more clouds, rain, and possibly thundershowers, I decided that I would skip the 53rd latitude and head for the 54th, and a confluence that was supposed to be in the city of Vanderhoof - 54N124W.